This month we're introducing you to Jessica Magenwirth, former veterinary student & Bayer Fellowship Program member who shares our passion for animals. 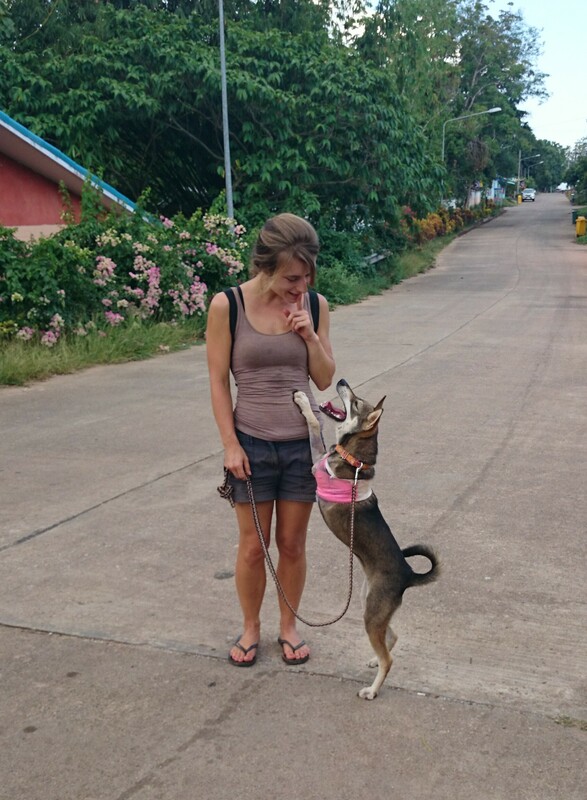 In a three-part blog post series, you'll learn how Jessica is connected to Bayer Animal Health, what she experienced when working as a volunteer veterinarian in Sangkhlaburi (Thailand), and what #OneHealth means to her. Be inspired! For starters, please tell us a bit about yourself. What's your story and how are you linked to Bayer? My name is Jessica Magenwirth and I graduated as a veterinarian from the Free University Berlin in 2014, where early on I developed an interest in One Health/Ecosystem Health, wildlife health and conservation, and infectious diseases. It has always been important to me to think outside-the-box for gaining knowledge beyond university classes; especially within those non-traditional fields and career paths of veterinary medicine. To broaden my knowledge and skills in those areas I tried gaining as much experience as possible during my studies through various externships, conferences and workshops in different parts of the world. After an eye-opening summer school - a self-conducted research project at Cornell University (New York, U.S.A.) during my 6th semester of vet school, I decided to study infectious diseases, One Health, pathology and wildlife health during externships at various universities and organisations across North America. My business relationship with Bayer began during my studies in Berlin. As one of the first students in Berlin I was awarded with the Deutschlandstipendium (Germany stipend). This scholarship is sponsored by the German Federal Ministry of Education and Research and in some cases in partnership with the Bayer Science & Education Foundation. The program offers financial support to students who shine out through their achievements at university and social engagement. Without this scholarship, many of my externships abroad would not have been possible. In addition to my veterinary studies and externships, I also participated in a number of online courses. This allowed me to learn more about the fascinating topics of emerging infectious diseases, zoonosis which means the transmission of diseases between animals and humans, and One Health an interdisciplinary approach that focuses on the premise that the health of humans, animals and the ecosystem are inseparably interconnected. Through the world wide web, I was able to pursue an online graduate One Health course at the University in Saskatchewan in Canada. Participating in this course I learned a lot about interdisciplinary approaches to disease mitigation. Furthermore I was also able to attend seminars on food safety, infectious diseases, and public policy. Following graduation, I have been able to develop myself in the areas of veterinary science by working with non-profit projects as a veterinarian focusing on approaching public health problems from a One Health perspective. For two of these projects, I was again fortunate enough to receive support from the Bayer Science & Education Foundation, this time through the Bayer Fellowship Program. The first project enabled me to work with the endangered mountain and Grauer’s Gorillas, which meant joining “the team of Gorilla Doctors” as a volunteer veterinarian in Rwanda, Uganda and the Democratic Republic of the Congo. Needless to say, seeing these fascinating animals in the wild, while being able to contribute to their conservation, was an absolutely incredible experience! The second project led me to rural Thailand, where I spent half a year working as the only veterinarian within a radius more than 100km (60 miles)! In Thailand I was able to help improve animal health and welfare while raising awareness of welfare issues and disease risks such as neglect of animals and infectious diseases like rabies.